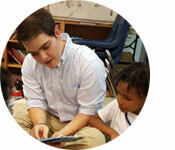 Guest blogger Zach Griffin is with AmeriCorps VISTA, serving as both a volunteer coordinator to The Reading Connection and an education strategy VISTA to United Way Worldwide. At The Reading Connection, a large part of Zach’s job is running and evaluating their six-week summer reading program, We Are Readers. For more than 25 years, The Reading Connection (TRC) has been making sure kids get read to and have books of their own. Our organization is dedicated to improving the lives of at-risk children and families by helping them create and sustain literacy-rich environments and motivation for reading. This is especially important during the summer months because kids are susceptible to “summer melt” if they’re not academically engaged during out-of-school time. By inspiring children to read, we can help them strengthen skills that will help them excel. You can find out what books mean to our TRC families in this video. My AmeriCorps service year as a volunteer coordinator VISTA with The Reading Connection began a couple months ago — back in mid-June. Since then, I’ve spent the majority of my time overseeing our six-week summer reading program, We Are Readers. 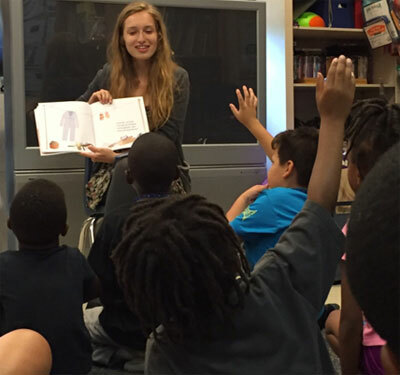 At five of our sites over the course of the summer, we have hosted 54 read-alouds, logged 475.5 volunteer hours, reached 114 children, and, perhaps most importantly, given away 571 books to children who may not otherwise get them. I am immensely proud to have been a part of that effort. TRC read-alouds are heavily theme-based, and that’s certainly the case during the summer program. 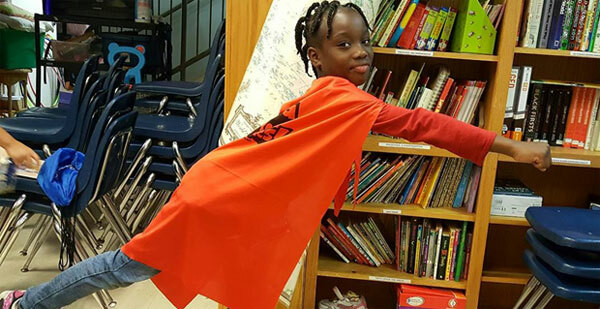 This year our overall theme was superheroes — specifically how you can “be your own superhero.” Kids were encouraged to reflect and consider what their own superpowers were — because not all superheroes have the same powers! After working through the concept of “be your own superhero,” we introduced kids to more superheroes: superheroes of the community, superheroes of the animal kingdom, super foods, super STEM, and super authors. TRC’s way of reading aloud is interactive — there’s a conversation going on between the reader and the listeners. Themes can help make that conversation even more interesting. For example, when I led a super STEM read-aloud, our focus was on light and color. During our “colorblind test” activity, I stopped to let the kids ask questions and discuss their thoughts on the ideas we were exploring through the activity. That led our discussion to the colors of the rainbow, so we read Warthogs Paint by Pamela Duncan Edwards which teaches the colors of the rainbow and how they all mix to make other colors. Another TRC volunteer taught them how to use the acronym “ROYGBIV” (Red, Orange, Yellow, Green, Blue, Indigo, and Violet) to remember all of the colors. During the third week of We Are Readers, I led another read-aloud about super foods. There are tons of interesting books about food, of course, like Cloudy with a Chance of Meatballs by Judi Barrett and the old folk story Stone Soup, so we read a couple of those before our activity. A local bakery, Village Sweet, provided “super food muffins” (made with zucchini, carrot, and currants) for the kids to try, and they loved it! It sparked a conversation about which foods they had and hadn’t tried, and they started to make a game of it. So, we stopped and read Eating the Alphabet by Lois Ehlert together, which is basically about a ton of fruit and vegetables from A to Z. They really enjoyed thinking of the fruits and vegetables not shown in the book, and as many of our kids come from diverse backgrounds, it helped them learn a lot about each other’s cultures and backgrounds through food. Incorporating a theme into a read aloud session can help really drive home new concepts, as well as build kids’ background knowledge on any given subject. Every read-aloud presented by TRC, either during We Are Readers or the school year, involves a theme, and planning all of those themes and activities can be overwhelming at times. Even if you do have numerous sites and multiple volunteer teams to help prepare, resources like those at Start with a Book are incredibly helpful. They offer kid-friendly, pre-planned themes and activities which can easily be used in any setting–with a single child or with a whole summer group. Time-saving easy-to-use resources like Start with a Book are often essential to the success of programs like We Are Readers at The Reading Connection. In all of my read-alouds this summer, the kids loved engaging in discussions surrounding the themes introduced by the activity and the books, and they especially enjoyed sharing their ideas and learning from their friends. Combining a well-prepared theme, thoughtfully selected books, and plenty of time for discussion can make reading aloud extremely beneficial for children. Whether you volunteer with an organization like The Reading Connection, use resources like Start with a Book, or read to your kids at home, I strongly encourage you to creatively use themes to spark teachable moments with as many kids as you can!